No doubt the very thought of getting a shot can cause a child to have a meltdown in the doctor’s office. Even the very sight of needles can make the toughest moms and dads squirm. Kids tend to fear getting shots once they realize and understand that the needle leads to pain. Mental health experts estimate that needle phobia, sometimes called belonephobia or trypanophobia, may affect up to 10 percent of the population. Needle fears can trigger panic attacks, fainting, elevated heart rates and blood pressure, and the instinct to fight against a nurse or doctor. • Tell the Truth: Never hide or distort the truth of a procedure, especially with children. This can cause the opposite effect and actually make someone fear doctor visits even more. Be honest that it may hurt, but point out it won’t last for long. • Stay Calm: Use a soft and calm voice to talk to your child. Make sure to display a positive attitude through your facial expressions and body language to help ease your child’s anxiety of getting a shot. If you are feeling nervous, it can make your child feel more anxious about getting a shot. • Use a Distraction: No matter the age, a good distraction can go a long way. Distractions such as music, singing songs, telling jokes or looking at photos on your smartphone helps to keep your child focused on you and not the needle. Another plus: the distractions help put their mind at ease. • Try Breathing Techniques: Encourage your child to take slow even breaths with a goal of reaching 10 total. Keep the focus on breathing evenly regardless of what is happening. Tell your child to close his or her eyes and pretend that their lungs are like balloons that they need to blow up. This helps to remove the focus and the attention paid to the needle and the pain it might or might not cause. • Cough it Out: A 2010 study in the Journal of Pediatrics found that coughing once before and once during routine vaccinations helped reduce painful reactions among toddlers and children. Try this with your child – it might help. • Try Topicals: Minimize fears by asking your doctor for a topical anesthetic, a numbing or cooling type creams. They can help minimize the fear and some pain, if even part psychologically. You can also ask your child’s doctor or nurse if they can use a butterfly needle instead – it’s smaller and less painful. • Use Rewards: Reminding your child that he or she will receive a sticker, new coloring book, an apple or even praise and a hug can be used as a reward. Always encourage bravery and practice facing fears. 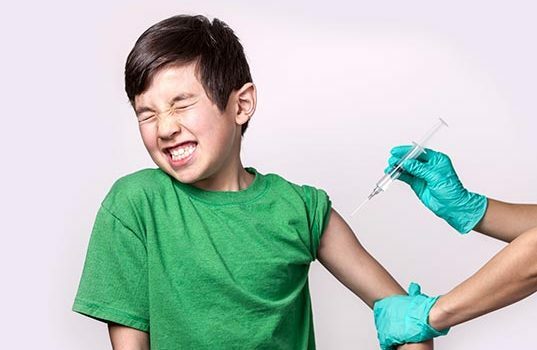 It is important to provide your child with encouragement, comfort and support to ensure that your child’s vaccination experience is as positive as possible. You can always ask for extra time to help your child if needed. At the very least, talking about what to expect and why the shot is needed with your child and his or her physician shouldn’t hurt.